Remember that horrifying story published in the New Yorker last summer? 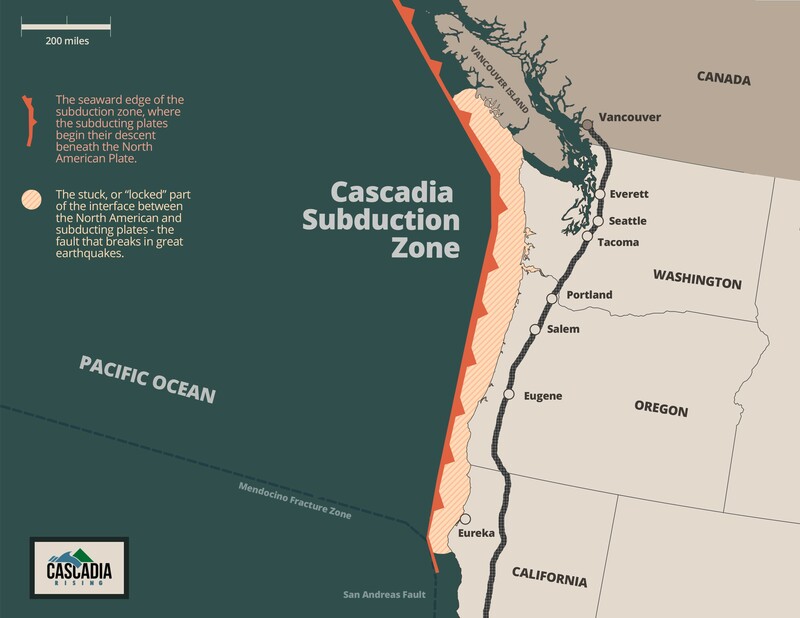 The one about what could happen if the Cascadia subduction zone along the Pacific Coast fully ruptured, causing a massive earthquake and tsunami? In the Pacific Northwest, the area of impact will cover* some 140,000 square miles, including Seattle, Tacoma, Portland, Eugene, Salem (the capital city of Oregon), Olympia (the capital of Washington), and some seven million people. When the next full-margin rupture happens, that region will suffer the worst natural disaster in the history of North America. Roughly 3,000 people died in San Francisco’s 1906 earthquake. Almost 2,000 thousand died in Hurricane Katrina. Almost 300 died in Hurricane Sandy. FEMA projects that nearly 13,000 people will die in the Cascadia earthquake and tsunami. Another 27,000 will be injured, and the agency expects that it will need to provide shelter for a million displaced people, and food and water for another two and a half million. 'This is one time that I’m hoping all the science is wrong, and it won’t happen for another thousand years,” Murphy says.'" Besides winning a Pulitzer Prize and setting off a chain of reactionary articles, blogs and other reports in the weeks to follow, the harrowing possibilities of a 9.0 magnitude earthquake rocking our Pacific Coast states instilled some truly unshakable fear in many. While there's no way of knowing whether a catastrophic Cascadia quake will happen in five, 10, 100 or even 500 years, seismologists quoted in the New Yorker feature say the odds of a big one (between 8.0 and 8.6 magnitude) happening in the next 50 years are one in three. The odds of an even bigger one (8.7 to 9.0 magnitude), in which the entire 700-mile fault zone subducts, are one in 10. Regardless of which of these two scenarios happens — and when — first responders and government agencies across the Pacific Northwest are preparing now to face the devastation and destruction. This week, from June 7-10, more than 20,000 people with a host of agencies — including many Washington Air National Guard soldiers stationed at Fairchild Air Force Base — are participating in the Cascadia Rising exercise, the biggest yet to be held as preparation for the pending West Coast disaster. Overseen by FEMA, teams from state and local agencies, the U.S. military and tribal agencies, along with officials from British Columbia, are teaming up in Western Washington and Oregon to practice and outline their collaborative response to the devastating quake. Amateur ham radio operators in the region — who will play a key role by providing communication when all other options are offline — are also participating in drills, the Seattle Times reports. Here's FEMA's 180-page report outlining the Cascadia Rising drills and potential impacts of the quake. It gets into the gritty reality of everything, like which coastal communities will be wiped out by the tsunami, and fatality estimations broken down by state. There are also regional maps that show which roads, bridges and other transportation infrastructure will be impassible, potentially stranding people who live and work on opposite sides of major waterways. FEMA also mapped out estimated damage to regional railways, airports, seaports, dams and levees, electrical power systems, natural gas pipelines, fuel refineries, water/wastewater facilities, hospitals, schools, facilities that house and dispose of hazardous substances and much more. Thinking of all the ways that communities will be completely crippled by a massive earthquake is truly dismal. In areas where Cascadia Rising exercises are taking place this week, local emergency response agencies are reaching out to the public to make sure they're prepared, too. In Grays Harbor, Washington, agencies haven't been fully informed of all the training tasks to take place. A major purpose of Cascadia Rising is to identify where improvements can be made to agencies' response plans. Further north on the Olympic Peninsula, responders will practice evacuating for the tsunami, mapping distribution points for food and water and unloading ships without the use of port facilities. How will the "big one" affect those of us on the inland side of the state? Last year, in response to the New Yorker's piece, the Inlander took a look. Mostly, we'll be OK, yet completely cut off from our Western Washington neighbors.